Telford & Wrekin Council has invited the chief executive of Severn Trent Water to this week’s Full Council meeting to explain and apologise for delays to the works at Limekiln Bank roundabout. The council is also seeking legal advice to recover appropriate costs and compensation from the utility company, with the outstanding bill at nearly £160,000 and further compensation being sought. In a strongly worded letter to Severn Trent chief executive Liv Garfield, council leader Shaun Davies and Councillor Angela McClements, cabinet member for Neighbourhood Services, hit out at Seven Trent’s failure to complete necessary diversion works. This failure means the rest of the works planned to upgrade the roundabout cannot take place until Severn Trent have finished their part of the work. The letter highlights that Telford & Wrekin Council came second out of 104 authorities for overall satisfaction in relation to highways and transport. It also points out that local contractor McPhillips has a fantastic reputation locally for delivering good quality work. 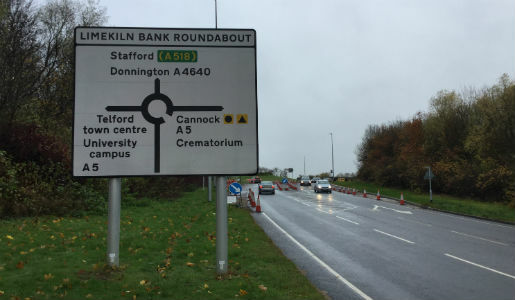 Limekiln Bank island is one of six roundabouts that are being upgraded across the borough as part of the Telford Growth Point package. This is funded by a combination of Marches Local Enterprise Partnership funding and Section 106 contributions from developers. It is aimed at improving capacity to ensure the road network is capable of coping with anticipated increases in traffic levels as a result of significant inward investment. However the work at Limekiln Bank island had an initial anticipated completion date of July this year and this has now had to be put back several times. “The delays are now causing significant complaints from residents, particularly those who live in close proximity to the works who have had to suffer with the works and traffic management for almost 10 months,” added Councillor McClements and Councillor Davies in the letter. “We have no choice other than to explain fully what actions the council has undertaken and explain the actions of Severn Trent Water as the cause of the unreasonable delays. The letter also says the council has paid £157,894.56 up front for the delivery of the works and expects to incur substantial additional costs as a result of the delays, including work it has carried out on Severn Trent’s behalf. The letter adds that the council is seeking compensation for this.